The Bowman vs Monsanto Supreme Court hearing is big news in the United States and we are seeing ripple effects of it up here in Canada. Although some headlines sparked by interest groups that oppose modern agricultural production methods, including use of genetically modified (GM) crops, might suggest otherwise, this case is not about farm-saved seed. This case is an attempt to make an exception in well-established patent law for products of agricultural biotechnology, thereby granting the purchaser of GM seeds the right to copies of that innovative technology. Bowman (the plaintiff and an Indiana farmer) and the Center for Food Safety (CFS) and Save Our Seeds (SOS) want the Supreme Court to reverse lower court decisions upholding Monsanto’s patent rights and conveyance of limited-use rights to farmers. Such a reversal would have great applicability to other industries and would devastate innovation in biotechnology and other technologies that are based on inventions that are readily copied. What incentive would inventors in the public and private sectors have to invest in research and development if they had virtually no protection from others copying their inventions? Bowman argues in the case of Monsanto’s patented soybeans, the company’s rights were terminated after the first sale and those rights should not extend to progeny with Monsanto’s patented technology. Years of public and private research costing millions and millions of dollars have gone into producing modern seeds that perform better than previous generations. Farmers want to plant the best, locally adapted and productive package of genetics available. 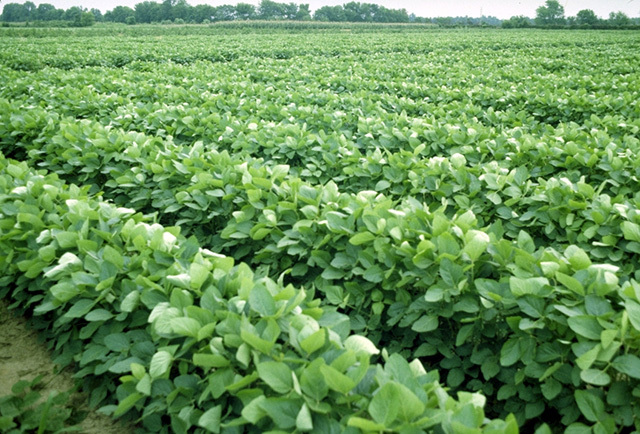 Patented soybeans are grown by more than 90% of the 275,000 soybean farms in the United States. For the record, nobody forces a farmer to agree to the terms of a seed purchase. If a farmer wishes to forgo the advantages of a superior variety, he or she can simply use older, unrestricted crop varieties. But as this case documents, farmers want to plant improved varieties and they want GM technology – the vast majority are willing to pay a premium for the benefits, and a few, like Bowman want it all and for free. Why are patents important? Patents are a provision of exclusive rights granted to an inventor for a limited period of time. Rhetoric might suggest that patents are ‘bad’ but they drive investment in invention and innovation in the public and private sectors. Intellectual property rights (IPRs) exist for a reason. If there are no property rights, there is no protection. If there is no protection, there is no return on investment. If there is no return on investment, there is no innovation. And if that happens, we all lose. When Bowman purchased the commodity seed from the grain elevator, he knew exactly what he was buying. By planting those seeds, Bowman was using copies of the company’s technology for personal gain, just as if he had copied music or software and sold it for a profit; he didn’t have that right and he knew it. Reports coming out of the hearing on the 19th suggest that the Supreme Court is leaning in favour of Monsanto. The alternative would be unthinkable. Not only would there be huge implications for modern agriculture, but for self-replicating technologies in a range of industries that rely on IPRs to protect their investments (software, vaccines, cell lines). Without access to new and innovative crop varieties, we are hard-pressed to meet the challenges of a growing world population, shrinking arable land base, environmental issues, disease, pests and drought. Versions of this blog have been posted in: The Winnipeg Free Press (February 23, 2013) and the Huffington Post Alberta Ag Blog (Feburary 25, 2013). ← Brian John vs @Mark_Lynas. It’s Mark for the ‘conversational’ win. Cami, you are right. What Bowman did bears no resemblance to a real “saved seed practice.” Even in a typically saved seed crop like wheat, growers buy new certified seed every few years because otherwise the genetic drift in their own seed becomes problematic. Also in that industry growers have long been restrained from “brown bagging” certified seed which means selling some of your saved seed to a neighbor. In most cases those are varieties developed by public breeders, but the integrity of the certified seed production system is important enough to the grower community that they support such restrictions through their own seed associations. Cami, I’m no fan of SOS or CFS and certainly I don’t hate Monsanto or Syngenta. I’m having a hard time with finding fault with buying from a grain elevator, which normally sends the soy to CAFOs. As Steve points out, if all the farmers did that they would have genetic drift and would have to eventually buy the latest seed. The case reminds me of software design, or music downloads (do you use Spotify? ), or copying DVDs, or selling/buying used books. I brew my own beer and can save the yeast (which could contain bacteria) for subsequent batches, but it’s simpler to buy clean yeast from the supplier. IP is complex, indeed. And it is so difficult to convey those complexities in 1000 words or less. So much happens between patent app and product launch – if there EVEN is a product that comes out of it. I’m about 1-1/2 hour drive from Luther Burbank’s home in Santa Rosa. T. Edison worked to get Burbank the same patent protection for Burbank’ he enjoyed for mechanical inventions. Patents were extended to plants and Burbank’s wife lived off royalties until she died many years later (if memory serves, she was ~30 years younger). I’ve not followed the trial closely. Bowman bought this seed expecting ~90% of it to be RR soy, yes? Then, after the seeds sprouted, he sprayed them with glyphosate. Assuming 10% died after spraying, he was not exactly a savvy businessman. Knocking off 10% of profits can’t be good, even with the discounted price of seed (or it’s really, really, cheap). Nonetheless, Matt Ridley has a fascinating look at patents and their effect (affect? I really need more coffee) on innovation (and rent seeking) in his book, The Rational Optimist. His thrust is mostly at the effect they have to, in many cases, stifle innovation because they stifle competition (look at RIM’s Blackberry and the patent troll who nearly put RIM out of business). (Sorry, I recommend this book to EVERYONE). The issue of IP is complex and there are no simple answers (that I can see). I think we agree that this case is not about free seed. This case seems to be less about property rights and more about rent seeking to me. Time will tell, but by vigorously defending their patents, Monsanto may be choking off much needed acceptance of transgenics and innovation in their industry. I guess that if I owned a company and I invented something… I would want to protect it. At the very least recover my costs (yep, gets some rents) so that I could sustain my company. It is really difficult to say how things would be if there were no big ag companies in the world. I can’t even begin to speculate. But what I do know is that this case is not about farm-saved seed. That was what I was trying to convey in this post. Nothing more. A full-on evaluation of the patent system and how it is used by business to generate and sustain rents would require another few hundred pages, I am sure. “I guess that if I owned a company and I invented something… I would want to protect it.” Absolutely. And I am not disagreeing. I certainly don’t buy the “big [insert industry here] is evil” meme. Although I agree they need to protect their interest and make a profit, I’m just not sure it was in Monsanto’s interest to take this one on. I don’t see how they can come out of this one looking like they were the party that took a hit. I think their image takes a hit after this. And yes, Ridley = awesome. No matter the outcome, Monsanto will still be labeled the villain and Bowman the victim. Its kind of how things “roll” out of these cases. I’m just saying that there are OTHER actors in all this that assert agendas and seem to come out smelling like roses. There’s some absurdity in that. Hi Cami, I found a good discussion at the Farmer’s Life http://thefarmerslife.wordpress.com/2013/02/19/quick-thoughts-on-vernon-hugh-bowman-v-monsanto-company/ Bowman looks like he knew what he was doing to get seed for the following season’s crop. I’m also gobsmacked by organic leaning NGOs making Bowman a poster boy for them. He wanted GMO soy, very un-organic. For certain NGOs (and parties with vested interests), it’s about timing, convenience, opportunity and the ‘spin’. Organic or not-organic? Doesn’t matter. If there are factors at work that can serve a broader purpose, that’s all that matters. As long as it can be leveraged in the media, all the better. Bowman is pretty much a pawn in this media-making game. IMO. BTW – I quote Brian (Farmers Life) in this piece (and the op ed in the Winnipeg Press). Agreed about the “strange bedfellows” aspect. re: Farmer’s Life. It was the comments in the Farmer’s Life blog that struck me. They added much to my understanding.